I know the melody and rhythm of the tunes I want to play, so I don't need the dots on the sheet, but my memory is failing so I do need the notes. Here is how I do it. I use the letters in small case for notes gabcdef, then switch to capitals with the G on the D string, GABCDEFGAB. I know if I'm going for the high GAB, but in ink I draw a line over those to indicate a high note. I put a dot over a note to hold for a short time and a circle to hold for a long time. A comma, is a flat. An apostrophe' is a sharp. Sometimes I underline a note to remind me to go low on that note (the C towards the end in FMs "You Raise Me Up" comes to mind.) I write in first and second endings and codas and other things to personalize the tune. This works for me. It may not work for you. Sort of like your own tabular system.. If it works for you, it is good. My teacher wants to work with standard notation which is OK with me...to a point. It's the best way for her to teach exercises and such that I need to acquire a facility with the instrument. Although I read I don't sight read very quickly. I learned from playing piano many years, actually decades, ago. Since then I have played guitar professionally part-time and, like with most guitarists, it has never been necessary. I played mostly in clubs and shows but I worked a couple of seasons in a community theater pit orchestra. 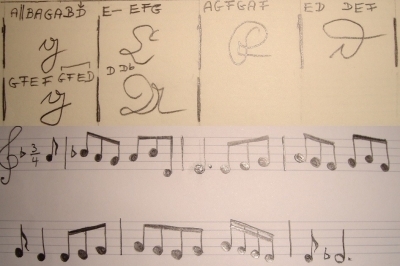 I worked from my own chord charts and I developed my own little system of mark-ups to indicate the notation where required. That included things like hash marks over the lyrics to signal time values. I have found that that is not uncommon among guitarists and even some keyboard players. In a lot of professional settings you need to memorize things like signature hooks and intros. The rest can be improvised if you have some sort of "road map" that you understand. I'm not discouraging anyone becoming proficient at standard notation but for most folks on this forum it may not be necessary for them to enjoy the fiddle. A basic knowledge is good though. I have a stack of music books 18" tall. I can read the music in them but it is exhausting and slow if I'm trying to play at the same time. If I just sit and read the music, I'm a lot faster. When I started violin, I bought a book and read through it, saying out loud the notes and remembering FACE and Every Good Boy Deserves Favor. The thing that helped me most was remembering that the middle line was B. I still have to stop and walk up to any note above high C.
If anyone would ever think of playing in any community group, learning and using written music daily would be well worth the effort. I have seen the ABC notation on a few sites. In the beginning it took me longer to see the letter, transpose the letter into it's dot spot in my mind, then play it. Weird huh! I write chords in historical current-letters and sometimes add musical subjects above or bass lines below. This example was composed by Telemann, I figured it out at the spinet while the CD was running. Later I wrote it out in notes too. I can't write musical notes while working at the spinet. It's possible but takes away concentration while trying to focus on the music I work out. This five lines business has always been a headache since I'm not visual at all, unmathematical and ungeometrical. My eyes easily miscount those 5 lines and I write a note on the wrong one. I have to erase again and again, just terrible. No, I write notes at the table where I can fully focus. Exemption: spinet solo settings......which always is going along with suffering, sighs and headache. I love it and I hate it. I guess you can see what the little arrow above the first D means: "Go down to the lower D, not up." Then very important to understand this: Frederic the Great tested Bach with an unusual task: "Compose something on the notes B, A, C, H!" The German note H is the English B, and if I write B it means Bb. Whenever I write chords for jazz musicians I will write Bb for them of course, since most German jazz musicians also learned English writing. I learned both but German writing first and find it clearer and more practical for myself. So in my old personal piano chords you will always see "H" and not "B". In jazz I still don't write chords in historical German letters, so later I can see right away whether it's general bass (baroque) or jazz. Well, I guess far over 90% of what I write today is general bass. Frederic the Great tested Bach with an unusual task: "Compose something on the notes B, A, C, H!" The German note H is the English B, and if I write B it means Bb. In Latin Friedrich certainly was F R E D E R I C U S R E X . Or better F R E D E R I C V S R E X . So it gets crazier still since there's a third percussion sound involved. I read the dots, and I agree sometimes its exhausting. 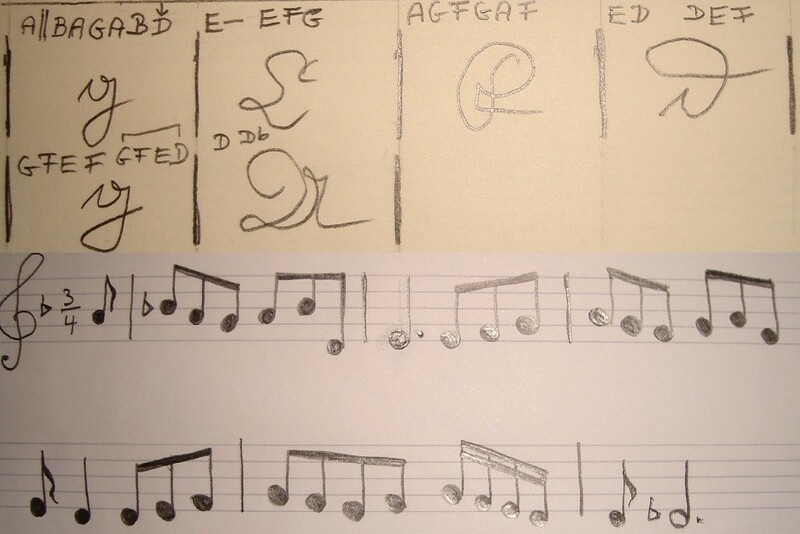 When I first was reading from sheet I had to mentally read each note as a C, or A etc. Now I just read the dots. What I have noticed that I used to "sing" the letters into the song...edcdbba.... and I would be able to memorize the song faster. Now that my mind doesn't read the letter in my conscious it seems harder to memorize the songs. That being said, muscle memory kicks in and play the rest of the line or two..but then I have a hard time finding where I am at. If I am thankful of anything.. the thing most is that I was taught and struggled to read sheet music. Since my ear playing took a very very long time to develop.